An F/A-18 Super Hornet fighter similar to one involved in an incident off the coast of Japan. The Marine Corps has identified the fighter pilot who died in a crash that occurred while practicing in-flight refueling off the coast of Japan. He was Capt. Jahmar Resilard, 28, of Miramar, Fla.
Another service member was rescued and five are still missing. The Marine Corps said Resilard served with Marine All Weather Fighter Attack Squadron 242, stationed on Marine Corps Air Station Iwakuni in Yamaguchi, Japan, according to the Associated Press. The Corps said the accident occurred "during regularly scheduled training" at around 2 a.m. local time Thursday, some 200 miles off the Japanese coast. In an earlier statement emailed to NPR, a Marines spokesman, 1st Lt. David Mancilla, said Thursday that seven crew members total were involved in the incident — two aboard an F/A-18 Hornet jet fighter, and five aboard a KC-130 Hercules refueling aircraft. 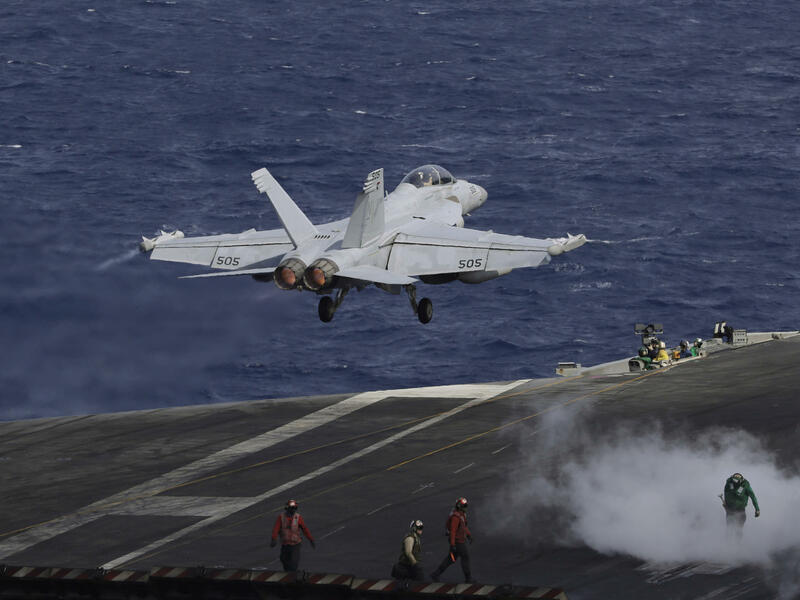 The two Marines flying in the F/A-18 were the ones who were found. A Marines spokesman initially described one as being in fair condition and said "the other is being transported to a local hospital for evaluation." Rescuers were searching for the five members of the KC-130 crew, assisted by the Japan Maritime Self-Defense Force and the Japanese Coast Guard. "The aircraft were conducting routine training and aerial refueling was a part of the training; as to what was taking place when the mishap occurred, that is under investigation," Mancilla said. "My heart goes out to the families and colleagues of Marines involved in this tragedy," William Hagerty, the U.S. ambassador to Japan, said at an event in Tokyo, according to Reuters. "They risk their lives every day to protect Japan and to protect this region and sometimes they pay the greatest costs," he added. "So I want to emphasize this security alliance that we have is critical and it is moving forward to the right direction." During their search efforts, the Marines received assistance from the U.S. Navy and Japanese defense forces. "We are thankful for the Japan Maritime Self-Defense Force's, the Japanese Coast Guard's, and the U.S. 7th Fleet's efforts as they continue to respond to the search and rescue operation," III Marine Expeditionary Force said Thursday.